Contrary to popular perception, this tortoise walked rather urgently. We pulled over about 50 yards further up the road and began hiking back towards the tortoise. As we got closer, he immediately turned and started running (yes, running!) towards us. Seriously. He reminded me of a puppy that had gotten lost and just seen his master! I don’t think I have ever seen something quite like that, and I don’t think I can really explain it, either. Once we got quite close, he turned away and crawled back up onto the road in an attempt to cross to the other side. I had grabbed my big camera, as I did not want to record this encounter with just my iPhone. I also did not want to photograph him on the road surface, so one of my companions picked him up (with gloves on) and brought him back over to the roadside where I began taking photographs on a more natural substrate. …and he wanted to get there quickly. This was one enormous tortoise—the carapace easily measured 12 inches in length, which I later read is at the upper end of the range for adults of this species. We marveled at his old-man head and thick, powerfully clawed front legs—an obvious adaptation for a digging lifestyle. I almost wish I had borrowed my companion’s gloves and taken advantage of the opportunity to pick him up myself and see how much he weighed. No matter—he was easily the largest testudine that I have ever seen! Who would think a tortoise could be so hard to photograph! I don’t know where this tortoise was going or why, but I do know that it was, surprisingly, one of the most difficult to photograph subjects I have ever encountered. He was quite capable of moving along at a rather quick pace (tortoise-and-hare fables notwithstanding) and never stopped urgently trying to cross the road. It was difficult to stay low to avoid a “top-down” perspective and still keep in front of him. We moved him to the other side of the road, thinking that might make him happy, but he would then just turn around and try to get back on the road and cross back to where he came from. I decided to just set the camera on autofocus and, with abundance natural light, starting snapping away to play a numbers game. Out of the few dozen or so exposures I got, the ones shown here are all that I kept (the others mostly showing a “bum” leg or two). The first photo at top is my favorite of the bunch. 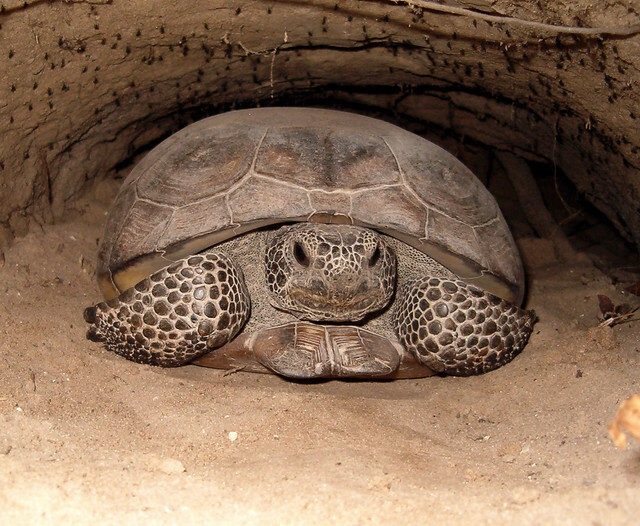 This entry was posted in Reptilia, Vertebrata and tagged Georgia, herpetology, nature, reptiles, tortoises. Bookmark the permalink. I have found that they are tricky as well! One thing that helps with all of the turtles is to use a polarizing filter. It is cool to examine their burrows, and if I was in their range again that is one thing I would like to do. It is great habitat for resting mosquitoes, and reportedly rattlesnakes as well! Excellent burrow photo! How does a polarizing filter help? It cuts a bit of the glare on the shell and helps make the colour richer. The eyes are always tricky though, I suppose some fill flash is called for. I didn’t think about trying to use fill flash, as bright as the ambient light was. It certainly would’ve helped fill in the eyes. Great idea about the polarizing filter—I have one for the wide angle but not the 100-mm. Awesome, Ted! Didn’t know you were in the area. I was just there last weekend for BugShot and had an extra day in Jacksonville, FL. So I took my rental car out to Ralph E. Simmons State Forest and greeting me literally under the entrance sign was a female Gopherus polyphemus! I was so excited! She move QUICK too and, like you, I found it hard to get a shot! I hope to see your photos soon. They are impressive animals! Very nice post about our friend in Georgia, Ted! I’m still surprised at how fast it could move.